The Durban International Convention Centre (Durban ICC) will pull out all the stops when it hosts the induction and gala dinner (Chapitre) of the Chaîne des Rôtisseurs Bailliage de KwaZulu-Natal, at the Centre on 28 February 2019. Guests will be treated to a seven course meal prepared by the Durban International Convention Centre’s Executive Chef John Moatshe and his team. The Chaîne des Rôtisseurs is an international gastronomic society founded in Paris in 1248 and has more than 25,000 members in over 80 countries around the world. The association promotes the art of fine dining, cuisine and supports the development of young culinary professionals, from all over the world, be it restaurateurs, hoteliers, executive chefs or sommeliers. “We are extremely excited to be hosting the Chaîne des Rôtisseurs, which is the oldest and largest food and wine society in the world. We look forward to an extraordinary evening of fine cuisine and wine,” said Durban ICC Chief Executive Officer Lindiwe Rakharebe. The award-winning Durban ICC’s unique approach to cooking and the ability to adapt to different culinary styles has ensured its success over the past 21 years. “Moatshe, is not only a dynamic chef and food enthusiast, but he is passionate about youth empowerment having mentored hundreds of junior chefs over his illustrious career spanning four decades,” said Rakharebe. Moatshe, has prepared mouth-watering meals for national and international heads of state, royalty, international and local celebrities over the years. Some of the dignitaries he has catered for include President Mandela, King Goodwill Zwelithini, Queen Elizabeth II, Sir Elton John and late former United Nations Secretary-General Kofi Annan to mention a few. “For the Durban ICC to be voted as Africa’s Leading Meetings and Conference Centre no less than 17 times in 18 years, bears testament to our consistent superb standards of culinary excellence and hospitality. This requires diligence, commitment and hard work. As a chef you need to be innovative, open-minded and have the ability to design menus that are of an international standard. Our industry is evolving and keeping up with international culinary trends and best practices has ensured our longevity,” said Moatshe. 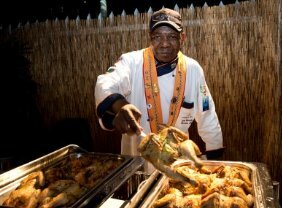 Having served for 10 years as a Chaîne des Rôtisseurs member, Moatshe was also a member of the original chef team which opened the Durban ICC in 1997. He started in the position of Chef Saucier before rising through the ranks to become Executive Chef in 2009. He has travelled extensively on exchange programmes with other international convention centres, including Kuala Lumpur, Adelaide and Qatar, imparting his knowledge and his passion for African Cuisine. Moatshe, who has been the Durban ICC’s Executive Chef for 10 years, was recognised with the prestigious Chaîne des Rôtisseurs Blazon for his achievements in the culinary field in 2013. “Since taking the reins as the Centre’s Executive Chef, we have come a long way in improving our culinary offering, particularly in showcasing African Cuisine of the highest standard”, said Moatshe. Moatshe, is inspired by Durban’s melting pot of culture and particularly enjoys preparing authentic proudly South African dishes, desserts and other treats, but he also enjoys appropriating exotic dishes using simple recipes and ingredient selections to suite any occasion.